Buckwheat, a pseudo-grain like quinoa and amaranth, is gluten-free and has a delicious earthy taste that teams well with sweet grapes and nutty hazelnuts. Toasting the buckwheat really brings out its flavour. 1. Preheat the oven to 180°C (350°F). Lightly toast the hazelnuts on a baking tray for 8-10 minutes, then wrap the hot nuts in a tea towel and rub off the papery skins. Chop the nuts coarsely. 2. Heat a large saucepan over medium-high heat. Add the buckwheat and cook, stirring, for 3-4 minutes or until fragrant. Add 500ml (17fl oz/2 cups) water and bring to the boil. Cover, reduce the heat to low and simmer for 12 minutes or until just tender (be careful not to overcook). Rinse under cold running water and drain well. 3. Slice each chicken breast horizontally through the middle so you have 4 thin fillets. Heat a chargrill pan over medium-high heat. Brush the chicken with extra oil and cook for 2-3 minutes each side or until lightly charred and cooked through. Brush the asparagus with oil and cook for 1-2 minutes each side or until just tender. Cool, then thinly slice the chicken and cut the asparagus into short lengths. 4. 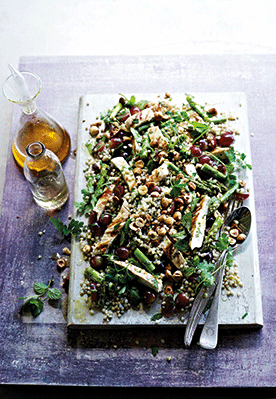 Combine the buckwheat, chicken, asparagus, grapes, herbs and half the hazelnuts in a large bowl. Whisk together the vinegar, olive oil, lemon juice and honey to make a dressing, and gently toss through the salad. Serve garnished with the remaining hazelnuts and extra herbs. Recipe taken from Real Delicious by Chrissy Freer (£14.99, Murdoch Books). Photography by Julie Renouf.